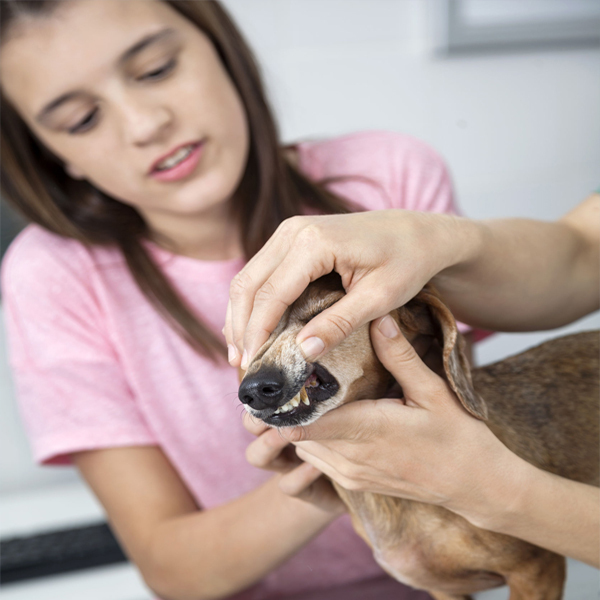 Taking care of your pet’s dental health is crucial for maintaining his overall health. But brushing your dog or cat's teeth can be stressful, which leaves many pet owners frustrated and unsure where to start. Wondering how to clean your dog's teeth? Or how to take care of your cat's teeth? Fortunately, Thomas Labs® is here to help. Providing pets with a safe, abrasive chewing activity is a great place to start. The mechanical removal of dental plaque through chewing is important for oral health. But don’t reach for just any chew toy or product! It's important to ensure that the product is safe, as well as effective. Natural Zeolites have been successfully used for many years in various toothpastes and teeth-cleaning products. These naturally-occurring minerals form where volcanic rocks and ash layers react with alkaline groundwater. These Zeolites provide a natural and safe alternative to control plaque and calculus formation. Thomas Lab’s® new product, Dental Defense, contains a Natural Zeolite with a unique, three-dimensional, honeycomb structure that offers gentle abrasive activity on the tooth's surface. It was specifically chosen for its crystal structure, irregular shell, and high surface area, all of which make it helpful for maintaining oral health. The Natural Zeolites in Dental Defense have also been shown to help neutralize the effects of toxins and help create a healthier gut and oral cavity environment. Need more reasons to choose Dental Defense? This highly palatable powder helps support your pet's overall dental health by helping control plaque and support gum health. It is intended for use between veterinary cleanings to help maintain clean, healthy teeth and fresh breath. Say goodbye to your cat and dog's bad breath! However you choose to do it, make sure you’re taking the proper steps to protect your pet’s dental health! The materials and information provided on this website are not intended to replace the medical advice or services of your veterinarian or other pet health care professional. Consult your own veterinarian if you have medical questions concerning diagnosis, treatment, therapy, or medical attention.